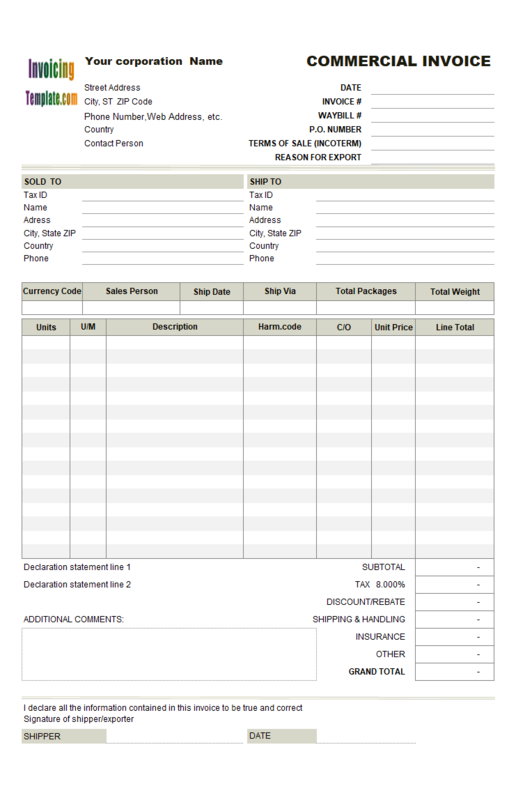 This commercial invoicing sample was a customized version of "c9002 Commercial Invoice - FedEx Style". 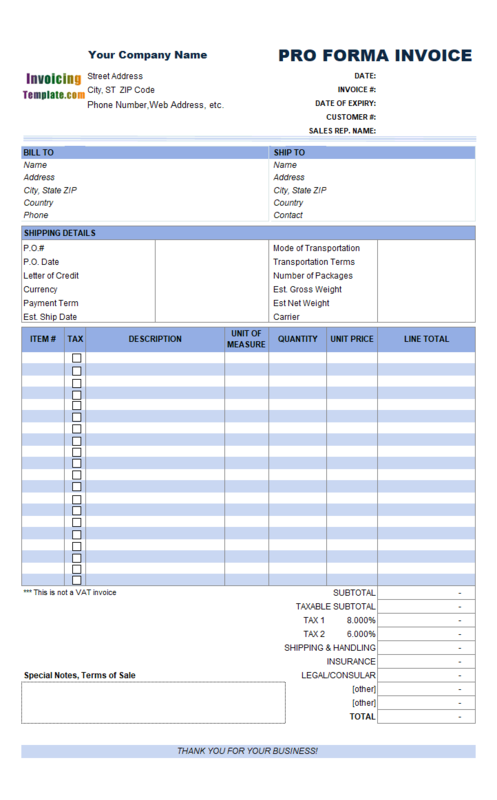 This form is still be printable on standard A4 paper, but the paper orientation is changed to landscape. 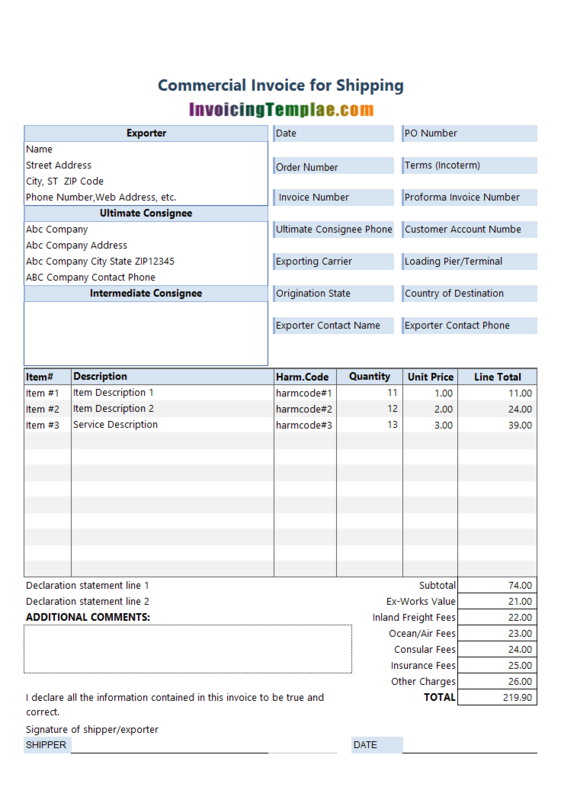 c9003 now includes the customized invoice template for the latest version of Invoice Manager for Excel. This is what you will see when you open commercial-fedex-landscape.xlsx. 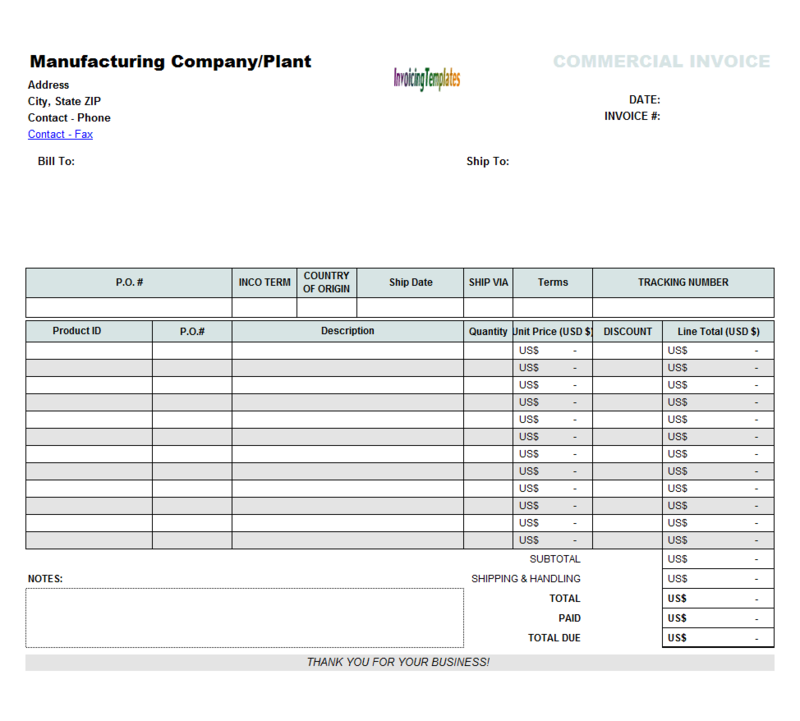 While the template at c9002 Commercial Invoice - FedEx Style implemented the layout and fields as the FedEx sample, many of you may find that the space left for the product description field is too small to fill your description text. To deal with this issues, we change the paper orientation from "Portrait" to "Landscape". This design allows you to enter longer description text. However the form has only 7 lines on the detail section now. In order to create this template, we've also moved the address fields on the "Shipper/Exporter", "Recipient" and "Importer (If other than recipient)" sections. The purpose of this movement is to make the sections occupy less lines on the vertical orientation. 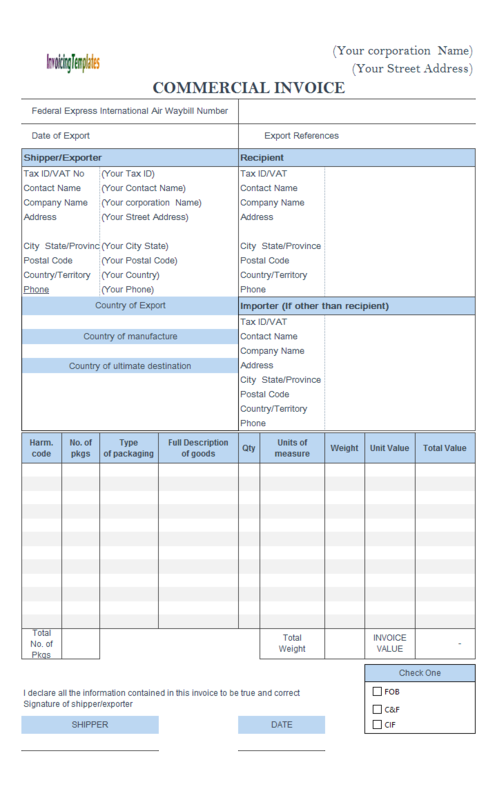 In the original design, each of the section occupy 8 lines for these fields - Tax ID/VAT No, Contact Name, Company Name, Address, City State/Province, Postal Code, Country/Territory, and Phone. Now each of the section uses only 4 lines. 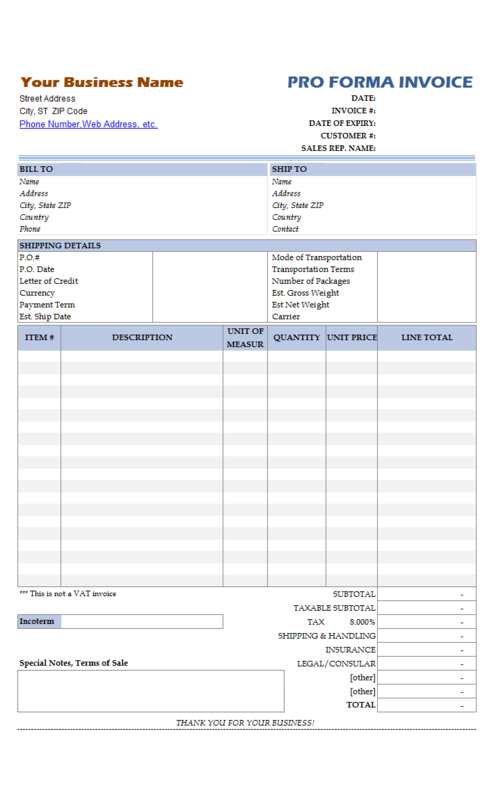 With this commercial invoice format design, the lines for "Federal Express International Air Waybill Number" still uses one whole line; "Date of Export" and "Export References" use another whole line. These fields are put on the top of the form because they are the most important cells, at least in the FedEx design. 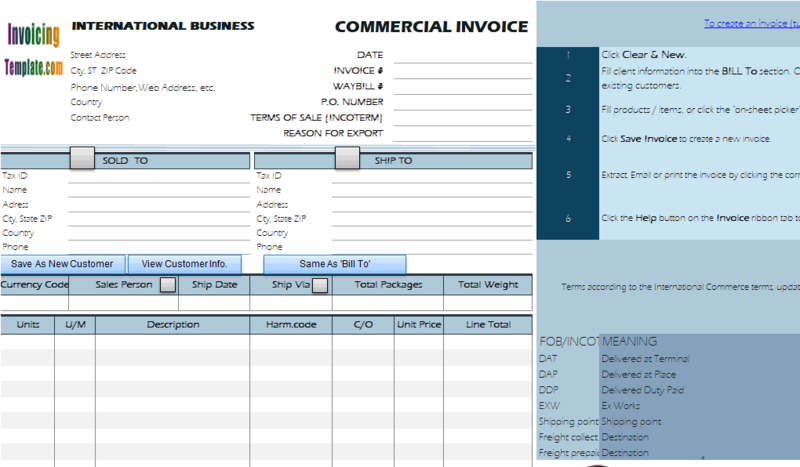 The PDF version of this blank commercial invoice template for shipping, which was created by using Excel's built in feature, has exactly the same layout. "Country of Export", "Country of manufacture" and "Country of ultimate destination" also have their locations moved in order to use less lines on the vertical orientation. Like the original design, this template has 8 columns too - "Harm. code", "No. 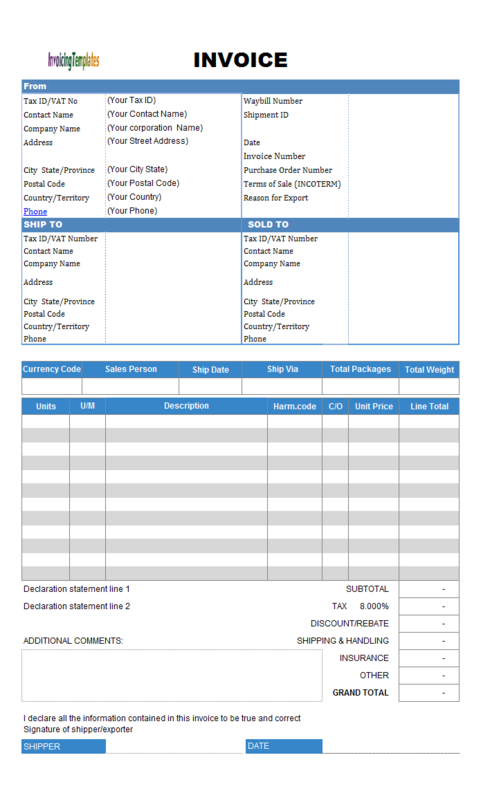 of pkgs" "Type of packaging", "Full description of goods", "Qty", "Units of measure" , "Weight", "Unit Value" and "Total Value". 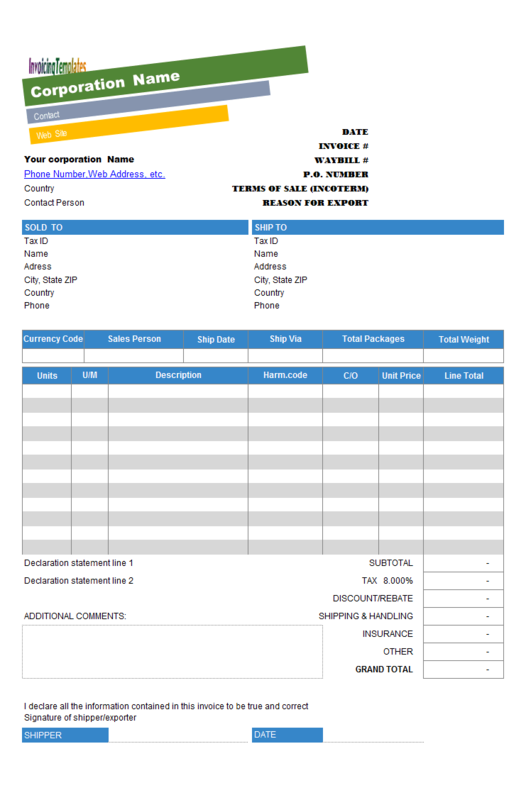 The "SHIPPER" and "DATE" fields on the bottom of the form are designed to be signed manually. As detailed on the FedEx web site, all shipments / freight must be accompanied by a FedEx International Air Waybill & two duplicate copies of commercial invoices. 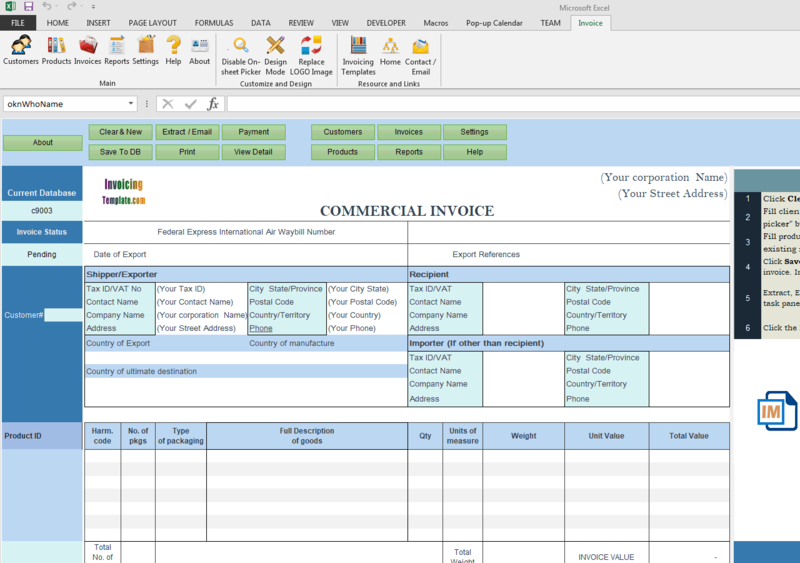 With Invoice Manager for Excel (namely Uniform Invoice Software) installed, printing of two copies of your commercial invoices could be done with a single click of mouse. Go to the Print tab on the Settings window to find all the printing options. 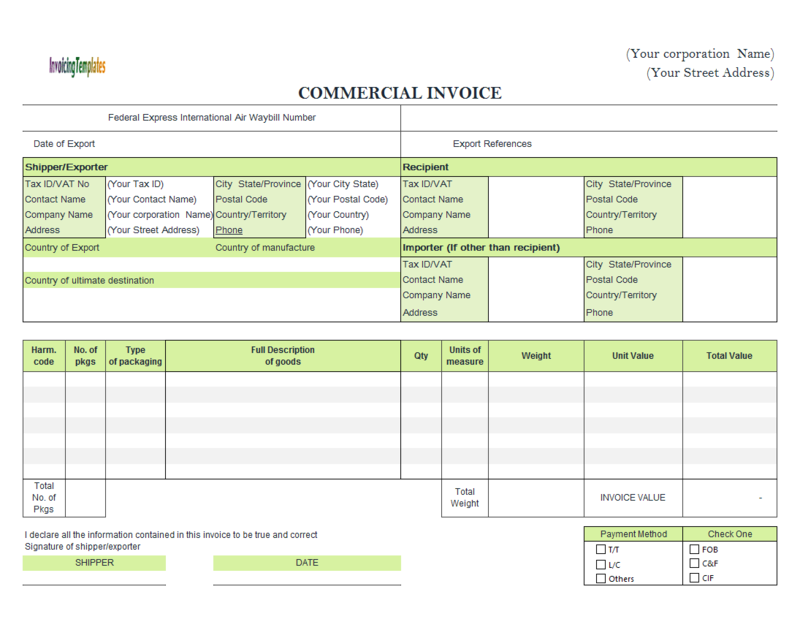 All forms available here on InvoicingTemplate.com are printable and fillable. You can adjust the printing and paper options by using Excel's own features too - for example, by choosing the options on Excel's Page Layout tab. 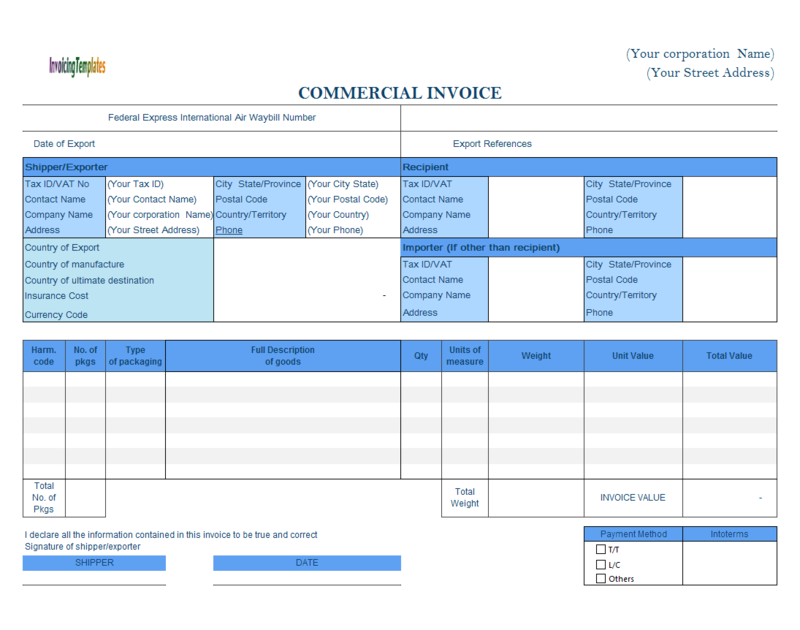 Here on InvoicingTemplate.com, we have a number of commercial invoices and proforma invoice template built for you to choose, including samples that are similar to layouts recommended by DHL, UPS and FedEx. 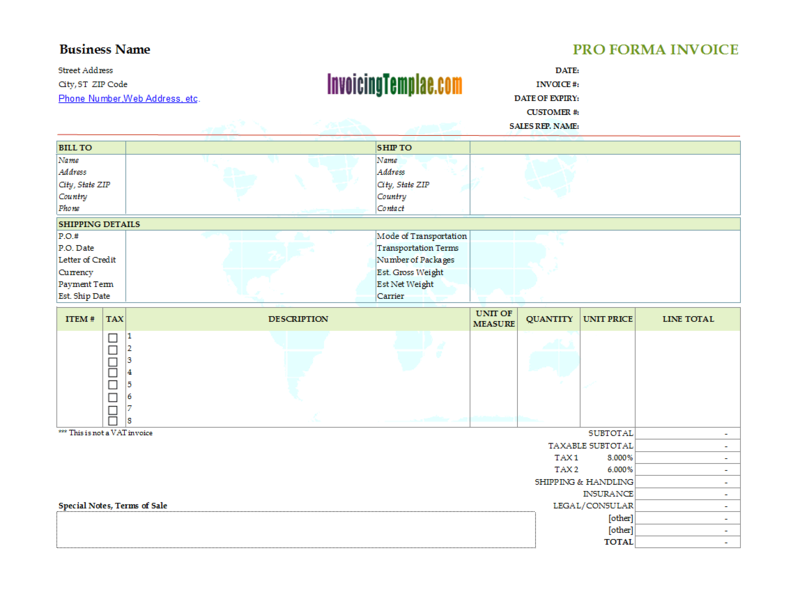 All the templates work well with Invoice Manager for Excel (namely Uniform Invoice Software). Feel free to visit U.S. Customs and Border Protection documentation for Requirements, criteria, or format of a commercial invoice, bill of sale, receipt that must be provided when clearing or filing entry documents. 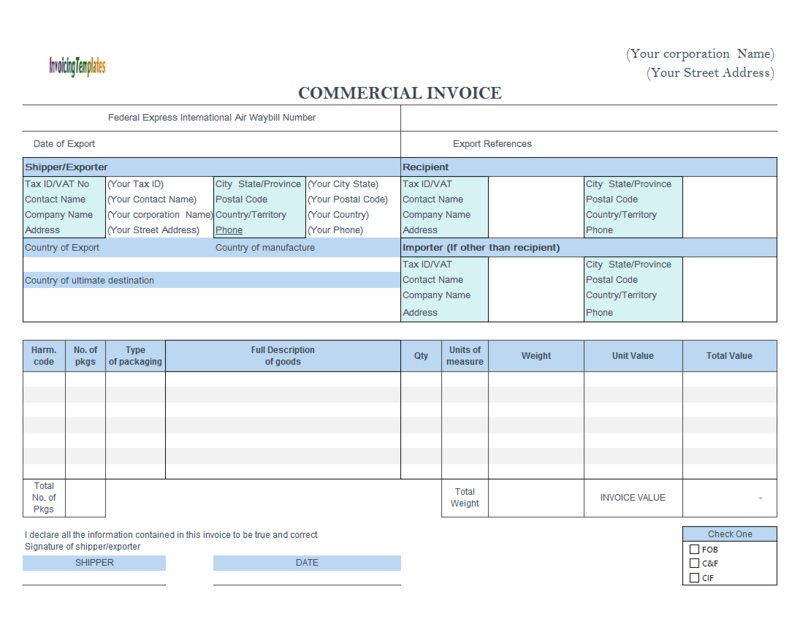 In foreign trade / international transactions, commercial invoice documents are important to both export trade and import trade. It is used when dutiable goods are shipped internationally, and as a customs declaration provided by the person or corporation that is exporting an item across international borders. It is used by the customs officials to classify your merchandise. This in turn will help them in correctly assessing the applicable duties and taxes. The Commercial Invoice is prepared by the exporter and is required by the foreign buyer to prove ownership and arrange for payment. 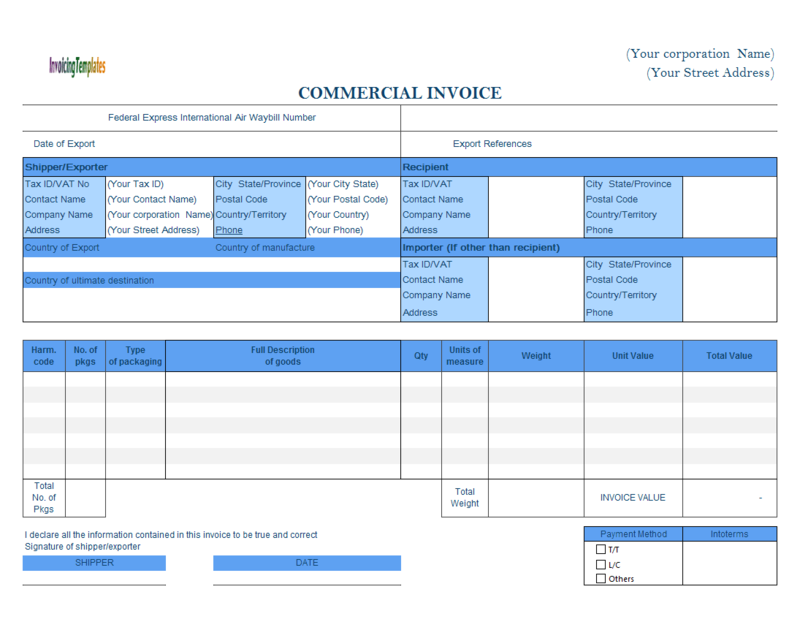 Like other form designs here on InvoicingTemplate.com, Commercial Invoice Format - FedEx Style (Landscape) is free (offered to you at a price of 0.00USD). It works on Windows XP and all newer versions of Windows, and Excel 2007, 2010, 2013 or 2016.